Has anybody managed to get the Tarot T4-3D to work on the Pixhawk using PWM output from RC9 (Aux 1) and RC10 (Aux 2)? It seems like most people have switched to using SBUS, but I’d like to use PWM if possible to control it programatically from the Pixhawk. @Helmet Have you had success controlling the T4-3D with the PWM output of the Pixhawk? I am wondering if it only understands SBUS. I have both. I’ve been testing with the Pixhawk. I verified that the average voltage is changing on the servo pins 9 and 10 when I change the PWM from 1100 to 1900 but the gimbal doesn’t respond. Some people have claimed it worked with PWM and many others switched to using SBUS using the RC controller that supports SBUS. I didn’t see a way to programatically specify an SBUS channel and value compared to the PWM values for a given servo channel. I configured the gimbal for “Convention” receiver type right now compared to SBUS. 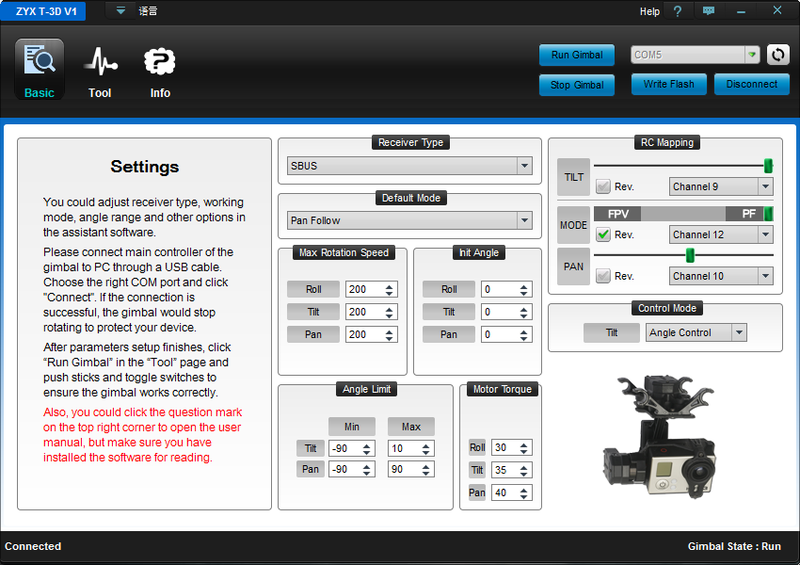 You have to specify Servo in MP’s camera gimbal setup page to use PWM. I connected my Tarot 5D3 through the pixhawk cube AUX channels using PWM and can verify that it does work. Thanks for the response. I’m not using the RC to control the gimbal. I’m testing it by using the cmd_do_set_servo command to specify a PWM value for servos 9 and 10. This has worked with another gimbal that accepts PWM input. I moved the signal wire to the sbus connector and reconfigured the gimbal to use sbus, but I got no response from the gimbal for that configuration either. 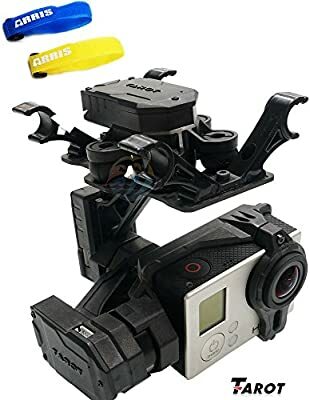 I’m beginning to wonder if there is a hardware problem with this gimbal. I noticed at one point that the cable connector was fairly warm. Its been cool since then so I wonder if something burned out. Yay, I got it to work with the sbus output. I just needed to enable the SBUS output with BRD_SBUS_OUT=1. I can control the gimbal with cmd_do_set_servo commands now and I imagine the mount commands will work now as well once I get the gimbal settings configured. Just confirmed that the standard gimbal setup in Mission Planner works as well. Yes, but I just wanted to test the servo output individually before I got fancy. I had a simple GUI interface where I could set the PWM value for a given servo ID. @rmackay9 BTW, I have another gimbal (Ronin-M) that doesn’t seem to have a way to remap the SBUS channels to the Pixhawk range (9-13) for the servos. (i.e. 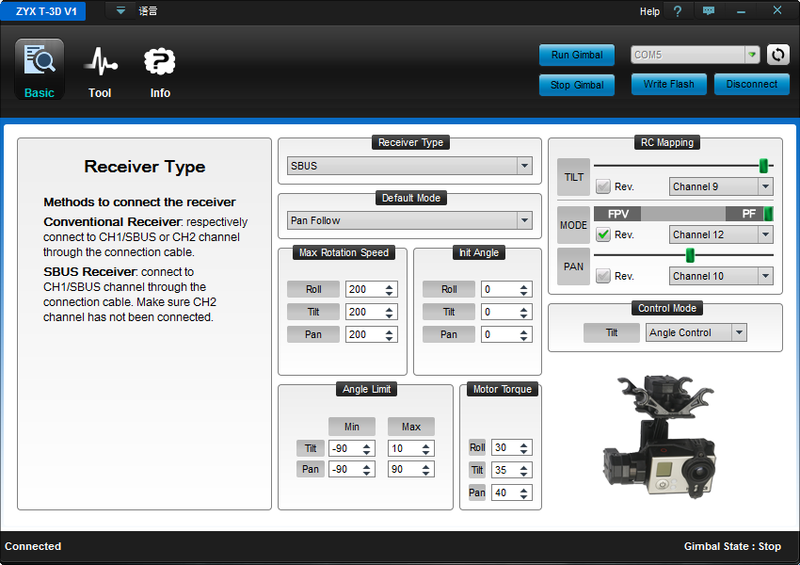 Roll, Tilt and Pan can only be assigned to channels 0, 1 and 3 using the Ronin config app.). How have people dealt with that? Its kind of hokey, but one thing I’m going to try is to use a SBUS to/from PWM converter device (e.g. https://www.ebay.com/itm/291784137911) so that I can connect the PWM cables to the 9, 10, 11 channels on the Pixhawk from the 0, 1, 3 inputs on the converter. @rrr6399, another alternative is to move the motor outputs to higher channels by using the SERVOx_FUNCTION parameters. One thing to be careful about is the “servo output banks” which means that the output rate (i.e. 400hz for motors, 50hz for servos) can’t be perfectly controlled per channel. So I think on a pixhawk or cube, MAIN OUTPUT 1 ~ 4 are in a single bank. then 5&6, then 7&8. So if for example you put the gimbal outputs on channel 1~3… attach the motor ESCs to 5,6,7,8, etc. Craig, I started off just sending servo commands to a given channel using Mission Planner or my own GCS. To do experiment with this, I changed SERVO[9-13]_FUNCTION=0 so that I can control them directly using the servo commands. 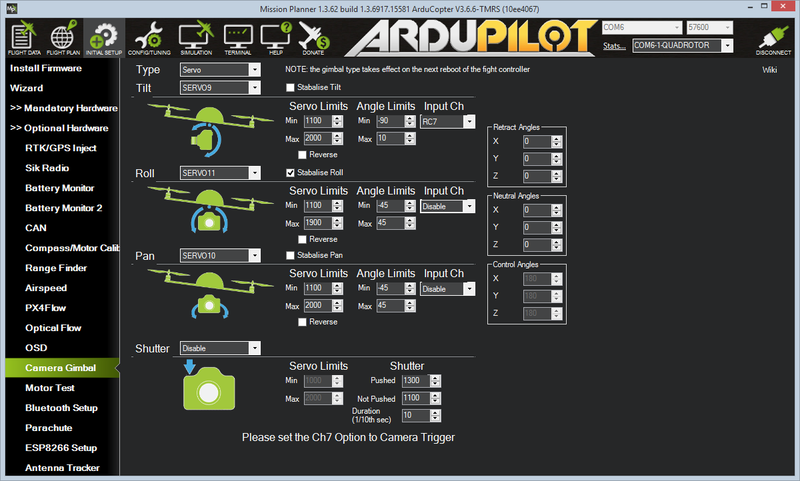 In Mission Planner, I used the Low and High buttons for channels 9-13 to move the gimbal to the min and maximum positions. Once I saw that was working, I switched to using the gimbal interface and made the assignments as shown in the last diagram below. Make sure you power the gimbal with a separate power source than the Pixhawk. I’m powering the servo rail with a ubec connected to the battery. Also push the safety switch on the copter to test the sbus connection.